Punjabi Chole with Amchur Crusted Aloo is possibly the easiest curry I’ve made in a long time. The chickpeas are packed with protein and high in fiber, and their buttery, nutty taste mixes well with this heavy on masala curry sauce topped with tangy, roasted potatoes. In a nutshell, you boil everything in a big stockpot, broil some potatoes and top it all off with onions. Easy. Tasty. Healthy. I can’t ask for more. Rajat’s mom gave me this recipe and while she gave me instructions and ingredients, as with most recipes handed down from Indian parents, there were no measurements or cooking times. I was a little skeptical as to how mine would turn out. I tweaked the recipe to make it little simpler, and my measurements below are for medium-spicy chole. *I used dried chickpeas, but you can substitute canned chickpeas. If using dried, soak the chickpeas overnight and then pressure cook. Reserve the water from the pressure cooker. When using canned chickpeas, rinse and drain the liquid in the can. **The tea bag helps to give the chole a dark brown/black color. It’s not used for flavoring. Amchur and the masalas will also help give it the black color. 1. Heat ~ 1 1/2 tspn. oil on medium heat in a tall stockpot. Add the ginger slivers and cook for about 1 minute. 2. Add the chickpeas and, if you pressure cooked the chickpeas, the water from pressure cooking. If you are using canned chickpeas, add about 3 cups of water. If you add too much water, you can let it boil off later. 3. Stir in 1 tspn. of the amchur powder and 1 tspn. of the turmeric (the remaining amchur and turmer are for the aloo). Stir in the other masalas. 4. Put the tea bag into the pot on one side letting the bag’s label dangle off of the side. 5. Cook on medium heat uncovered and let the chole come to a gentle boil. 6. In a small skillet, heat about 1/2 tspn. of oil and the paprika. Add the onions and cook until translucent. Mix half of the onions into the chole and keep half for garnish. 7. Let the chole boil until it reaches the desired consistency. It shouldn’t be dry but also not so liquidy that it’s soup like. 1. Parboil the potatoes (takes about 30 minutes). After they cool, peel the skin and cut into 1/2 inch thick slices. 2. Put the aloo slices into a large mixing bowl and drizzle with about 1 tbsp. olive oil. 3. Shower with 1 tspn. amchur powder, 1 tspn. turmeric and about 1/2 tspn. salt. Mix well so all of the aloo slices are well coated. 4. Spread evenly on a foil lined cookie tray. Brush the slices with a little olive oil and broil on high until the slices are golden. Flip and repeat. 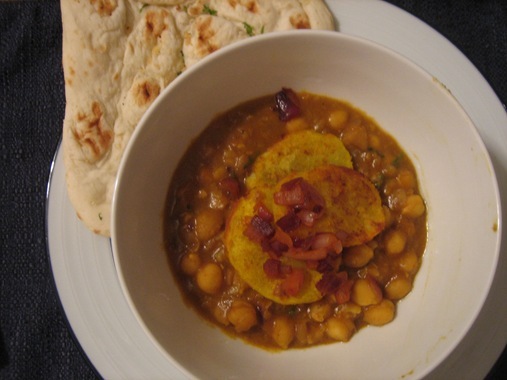 Top the Punjabi Chole with aloo slices and garnish with red onions. Diced fresh tomatoes are also a good topping. Tip for leftovers: If you have leftovers, store the Aloo and the Chole separately and then reheat separately otherwise your Aloo will get soggy. Recipes from Indian parents are often seemingly incomplete and confusing. How many of you have had this happen to you: there’s a flurry of instructions where various spices and ingredients are quickly mentioned and passed over and mentioned again, then invariably in the middle of relaying step eight a memory jog causes step three to suddenly change and interjected questions about “how much” and “how long” either go unanswered or are met with some vague quasi-measurement that only confuses further. Or my favorite is when thirty minutes after relaying the recipe, my mom calls to say an ingredient was accidentally omitted. By this point, of course, it’s too late. Don’t despair. I just taste whatever it is I’ve just made towards the end of the cooking process and then adjust spices and salt accordingly. Even the most accurate of measurements, cooking times and instructions aren’t a substitute for the good old fashioned taste test. Because if it tastes good to you, then no matter what’s the “right” way or the “wrong” way, it’s perfect. My mom always says that Indian females get to learn cooking by observing their mom’s in the kitchen. She never learnt anything from recipe books nor her mom wrote down recipes for her. You get better with your own experience . That’s why Indian parents can never pass down recipes with exact steps and measurements. Foodie, well fortunately males are learning a little something too nowadays 🙂 I learned a lot from watching the cooking and eating the food that both my mom and dad made. We all learn something from somewhere – a parent or neighbor or a cookbook that even just gives you a general idea what you want to create. While, as you said, there’s no substitute for experience, trial and error and tasting, an actual recipe with steps and measurements can help people get over their fear of cooking seemingly complicated cuisines like Indian food. That’s where I’m hoping this blog helps! Chhole look darn good right now…and those aamchur potatoes are something I’d like to try….ugh, I shouldn’t visit food blogs right before dinner time, now I’m in a dilemma on what to make! Trupti, I made the mistake of reading about your apple strawberry crisp during a late lunch and had to buy a bag of peanut M&Ms to satisfy the resulting sweets craving! You should be a menu writer. I love the amchur crusted aloo. What a great addition to your chole! This looks amazing. I will give this one a try Nithya! mmmm, I’m going to try this out!! @ Stacey – thanks for stopping by, let me know how it turns out. I love hearing feedback on the recipes. Btw we had some leftover aloo after I got tired of having the chole, and they are a great side even by themselves with rice and rasam or sambar. the cholle looks delicious..especially with the amchur crusted potatoes on top!! @Varsha, thanks! I’m looking forward to looking at your space too. 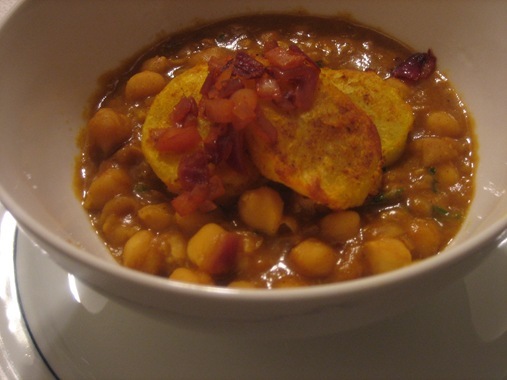 We’re not usually big chole fans, but I think this version won us over. Plus no chopping and making a masala, which is a nice break. I just wanted to say that made this dish today and it was absolutely delicious. I just discovered your blog recently so looking forward to trying lots more! This looks good, but I’m confused – are the potatoes really supposed to be boiled and cubed before use, as the ingredient list suggests? Sounds more like they’re supposed to be sliced into rounds after being parbroiled. Hi Amy, sorry for the mistake but you’re right – the instructions for the potatoes within the recipe itself (parboil, peel then slice in rounds) is correct. I’ve deleted the reference in the ingredients list. Thanks for pointing this out!